Imperial-controlled worlds are divided into Sectors, with each planet under the control of a corresponding Moff, in charge of overseeing Imperial government in their apportioned planets. The Moffs answer to the Grand Vizier. * - Imperial capitol world. Information:Ketaris, the new Imperial capitol, has had a long history with the Empire. Always an important trading center in the Outer Rim, the planet became an Imperial stronghold after the Battle of Endor. It eventually became integrated into the Imperial Remnant, and much later, Roan Fel's Empire. Its people have a strong penchant for supporting Imperial policy, so likewise, when the Sith Imperium came to power under Xander Starkiller, Ketaris pledged itself as an ally. A then-unknown Sith native to the planet, Darth Immortus, became the Imperium's envoy to Ketaris, although the planet retained de facto independence and continued to be ruled by its Royal dynasty under Siegfried Santori. When the Imperium collapsed, Darth Immortus, also known as Vanco Serath, organized a coup against the Crown under the banner of the Ketaris National Party, and usurped power from Siegfried. Darth Immortus married the Duchess, Saelia Santori, and became the Chancellor of Ketaris, before going on to organize the Third Galactic Empire. 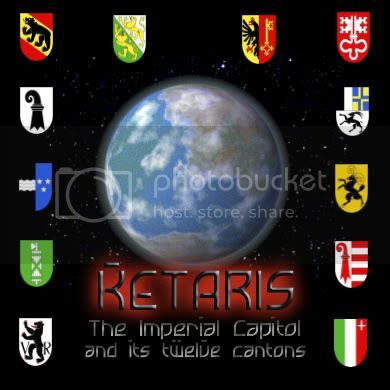 Thus did Ketaris become the new capitol of the Empire. The royalty and nobility still exist on Ketaris, though in name and tradition only. They have little real power, and the planet's twelve cantons are overseen by Imperial Governors and Prefects - a few of which, however, are former noblemen. Ketaris continues to be an important trading hub, which has generated a strong and wealthy economy, coupled by frugal social spending from the planet's former Dukes. Under the Emperor's rule, he has raised taxes and implemented a number of social welfare as well as infrastructure and environmental programs, keeping the planet's appearance lush and refined. Ketaris also continues to be home to the esteemed University of Ketaris, one of the galaxy's most prominent institutions of higher learning.